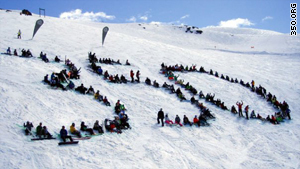 The Wanaka Wastebusters gather at a local ski mountain in New Zealand to call for 350 to protect their snow. London, England (CNN) -- From seabeds to mountaintops, people around the world were staging a day of demonstrations Saturday to call for urgent action on climate change. The events were being coordinated by a group called 350.org, whose name refers to the parts per million of carbon dioxide it considers the safe upper limit for our atmosphere. The group said it wants to "inspire the world to rise to the challenge of the climate crisis" ahead of the United Nations climate change conference in Copenhagen, Denmark, in December. Divers at the Great Barrier Reef in Australia and in the ocean off the Maldives held banners with the 350 logo. Skiers and snowboarders formed the number 350 on a snow-covered slope in Wanaka, New Zealand, and hikers unfurled a 350 banner atop Vinson Massif, the tallest mountain in Antarctica. Other events around the world were planned for Saturday, from Britain and Zimbabwe to Bermuda and Guatemala, according to 350.org. In all, more than 5,400 rallies and demonstrations were scheduled to take place around the world, all of them centered on the number 350, the group said. "We had no idea we would get the overwhelming support, enthusiasm and engagement from all over the world that we're seeing," said Bill McKibben, a writer and environmentalist who founded 350.org. "It shows just how scared of global warming much of the planet really is, and how fed up at the inaction of our leaders." The number of 350 ppm originally came from a NASA research team headed by American climate scientist James Hansen, which surveyed both real-time climate observations and emerging paleo-climatic data in January 2008, according to 350.org. It concluded that atmosphere containing carbon dioxide above 350 ppm couldn't support life on earth as we know it, the group said. "It's a very tough number," McKibben said. "We're already well past it -- the atmosphere holds 390 ppm today, which is why the Arctic is melting and the ocean steadily acidifying. To get back to the safe level we need a very rapid halt to the use of coal, gas and oil so that forests and oceans can absorb some of that carbon." McKibben and Hansen are "messengers" for 350.org, along with prominent leaders and climate change campaigners including Archbishop Desmond Tutu, Bianca Jagger and David Suzuki. "I believe climate change is the 21st century's greatest human rights and security challenge," said Maldives President Mohammed Nasheed, who is one of the messengers. His country, an archipelago of 1,200 islands, is threatened with disappearing under water if sea levels continue to rise. "If we cannot save 350,000 Maldivians from rising seas today, we cannot save the millions in New York, London, or Mumbai tomorrow," he said in a recorded statement released by 350.org. "Climate change is happening, and it is happening faster and with greater severity than previously thought."